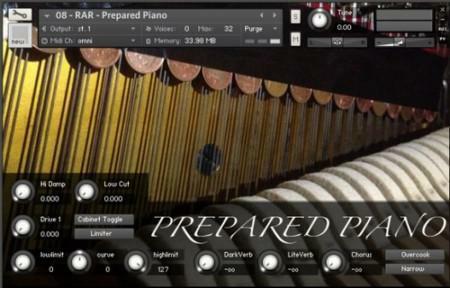 Two massive 5 octave toy pianos constructed from genuine toy piano recordings, loose tines, prepared piano recordings, celeste recordings, multiple mic positions, convolution based body resonance and lots of tweaking. NOT reliant on pitch shifted and stretched samples, this unique instrument carries the characteristics of a tiny toy piano across a previously unheard of range. The celestes were also recorded with a MUCH closer perspective than usual giving an intimate, detailed sound unlike most other recordings! The close mic was moved to EVERY tine to keep definition and maximise character! Different and very usable! Turn up the C-DUCER contact mics to get INSIDE the instruments that feature them!!! Also included are the two multi-sampled concert celestes as separate instruments with their full sustain, two toy pianos as individual instruments with an additional suspended tines instrument, and a prepared piano instrument also! There's also a very useful velocity control manager, two custom made convolution reverbs and some lofi/fx controls with processing specially voiced for The Stupidly Huge Toy Pianos And Friends! * 2 Multisampled Concert Celestes With Loads Of Controls And Options! * 4 Other Bonus Instruments Including Two Toy Pianos A Set Of Suspended Tines And A Basic Prepared Piano! * Requirements: Native Instruments Kontakt 4.2.4+ or higher.